Matt here. 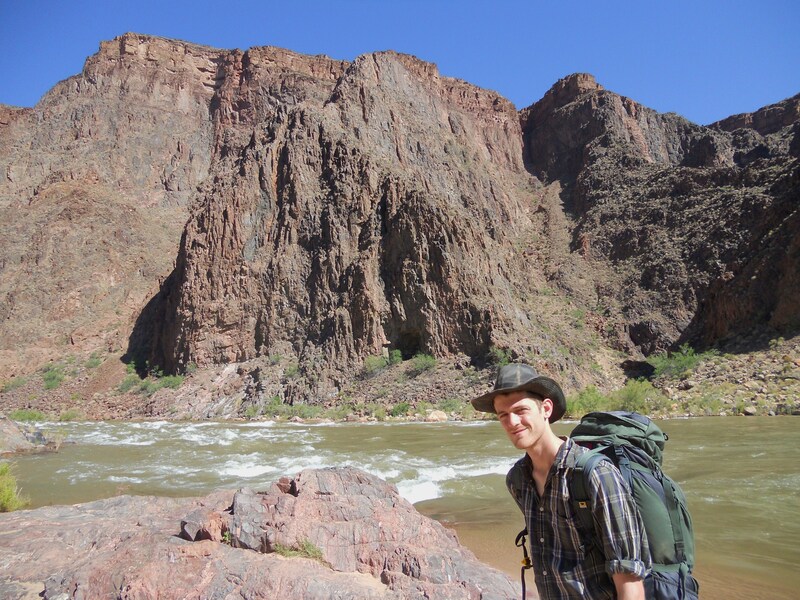 My brother and I just got back from our Arizona trip, which I had booked as a post-boards celebration. 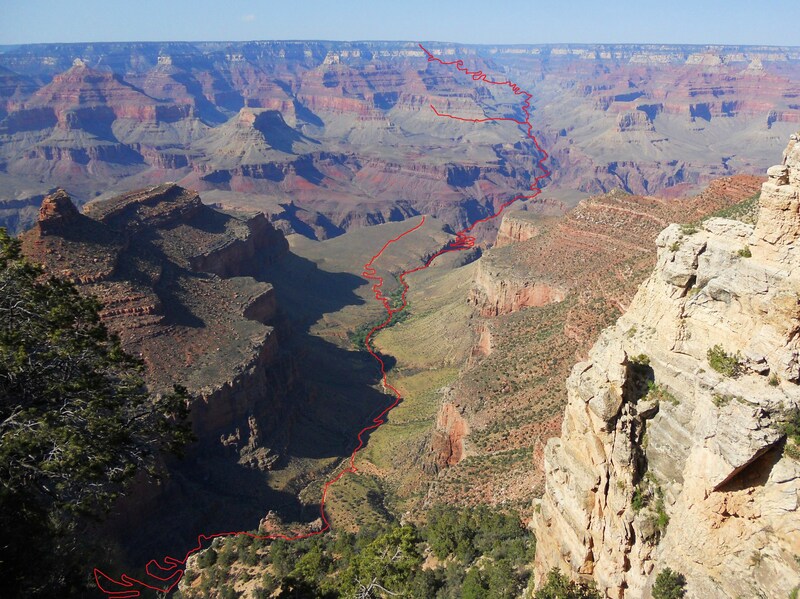 Our plan was to fly into Phoenix, then head up to the Grand Canyon for a 50 mile double-traverse trail run. 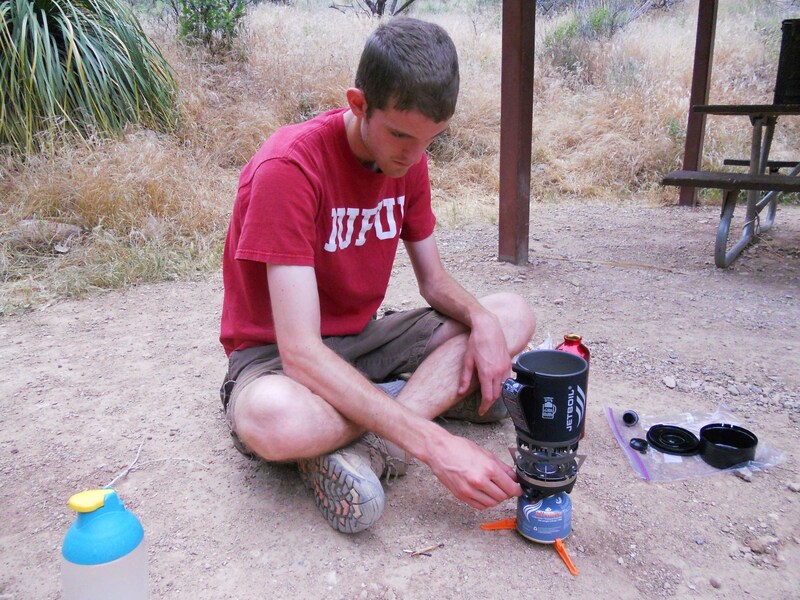 We got there early to scout things out on June 8, and had plenty of time to decide on our route before pitching a tent in the national forest and catching some sleep. 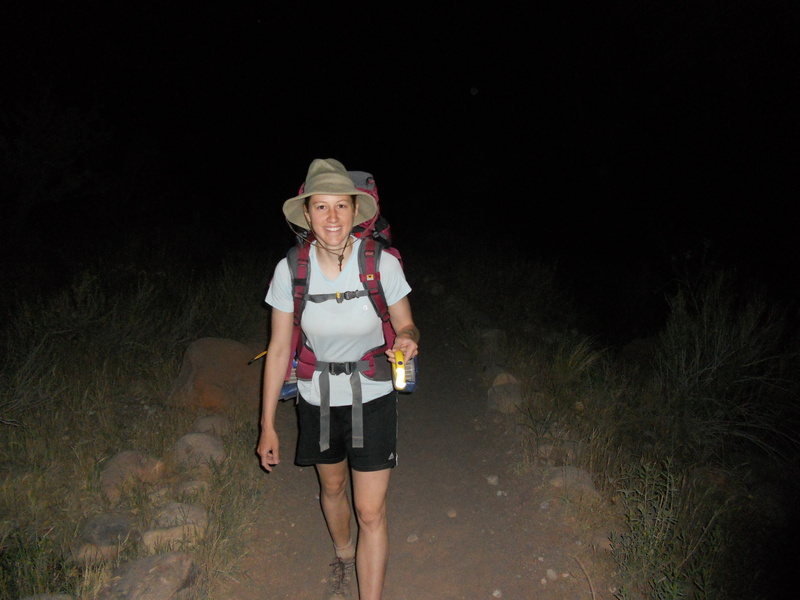 We broke camp around 2:45am and hit the trail a little after 3:30am. The first couple hours was all downhill, then it was all uphill from there (literally & figuratively). 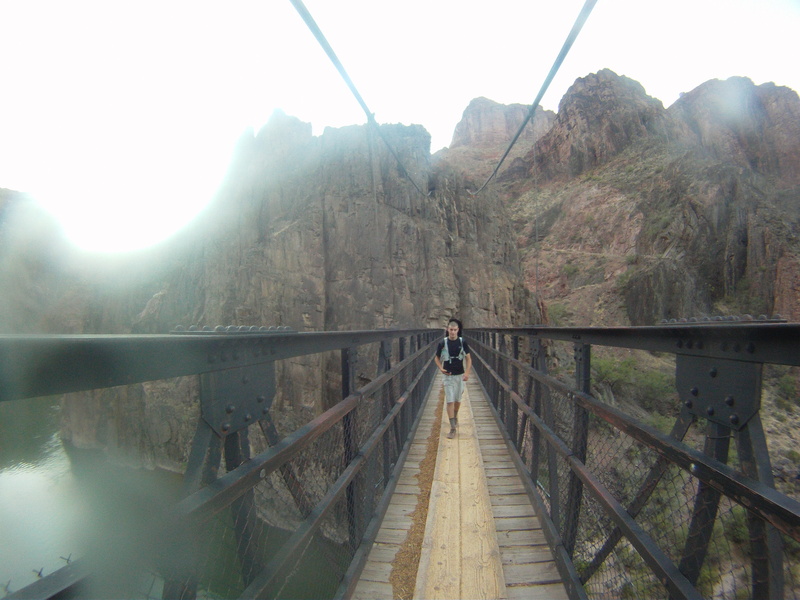 We made good time from the South Rim to the Colorado River – something like 8 miles in 1.5hrs, plus a few short stops. I never EVER get blisters running, but somehow I’d managed to do a number on the fronts of my toes from the constant deceleration of running downhill. No big deal though, because there wouldn’t be any more downhill for quite awhile. 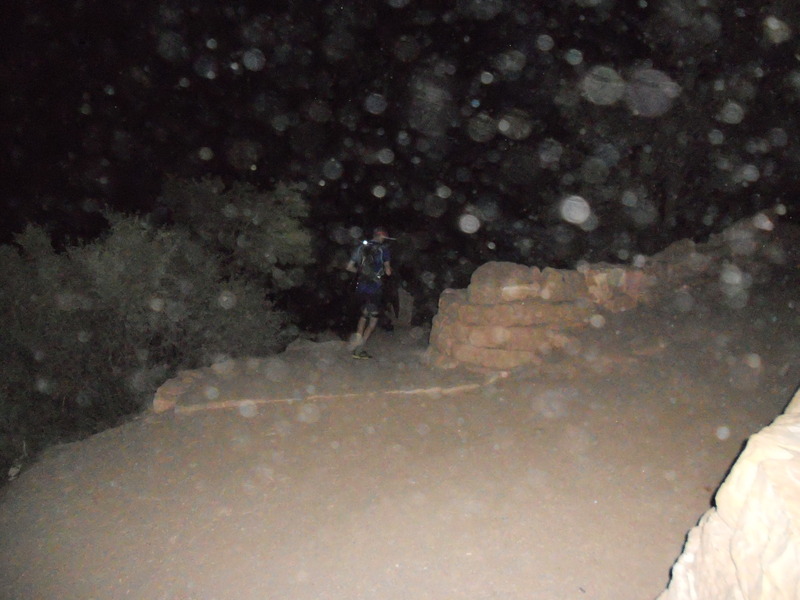 We stopped for maybe twenty minutes at Phantom Ranch to eat some GU’s and refill water. 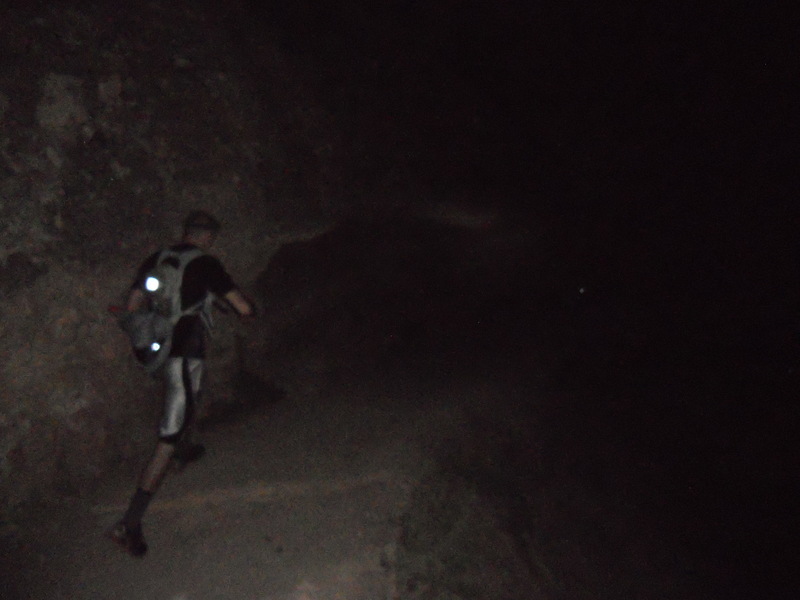 The sun was also starting to rise at this point, so we were able to ditch the headlamps. Unfortunately, not long after we resumed jogging, I caught a bout of nausea that slowed us down quite a bit. I felt fine again an hour later, but the lost time would come back to haunt us. 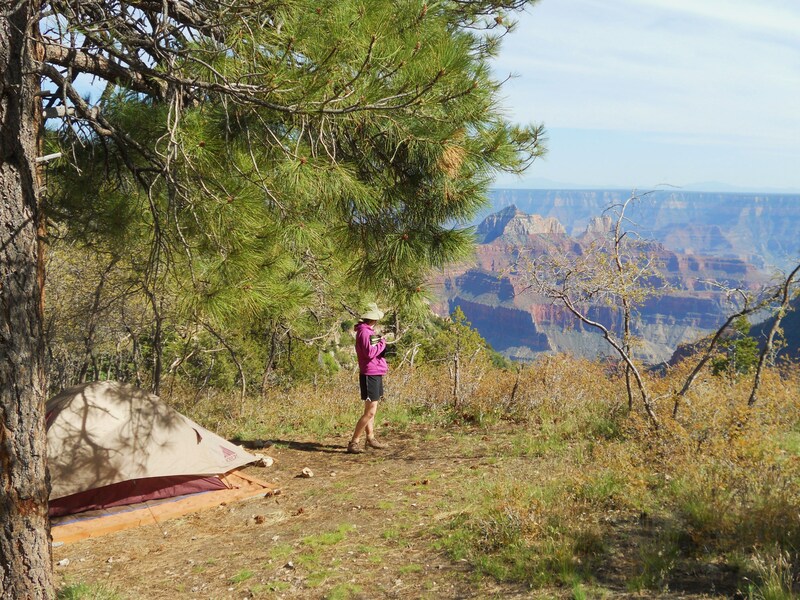 By the time we reached Cottonwood Campground, the sun was peeking over the canyon walls. 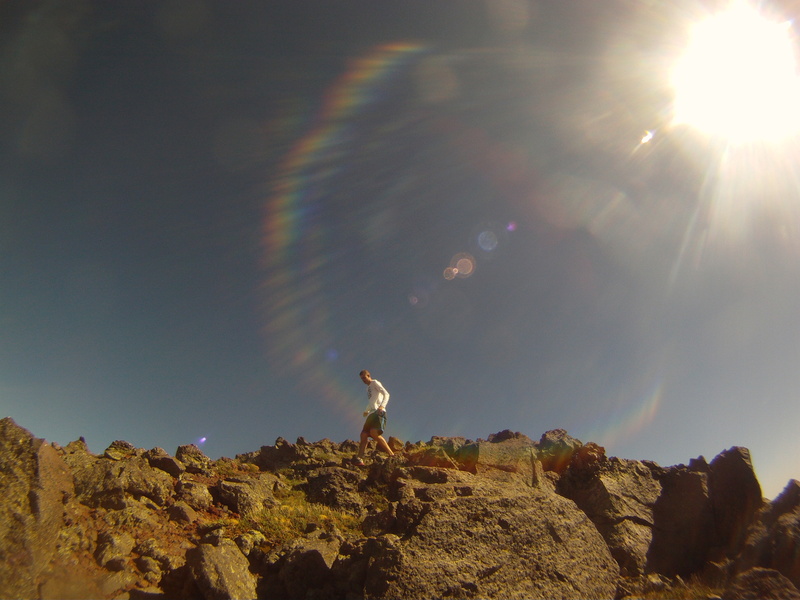 So we were looking at 8 miles and another 4000 feet of elevation gain in 90F+ temperatures. Yeah, that section wasn’t much fun. 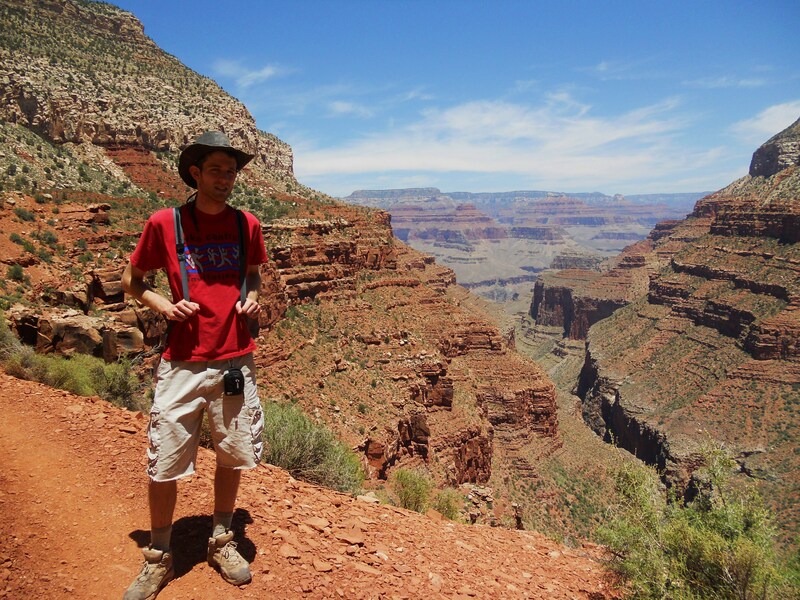 I felt like death 2 miles below the rim, while Trent seemed fresh and eager to keep moving. 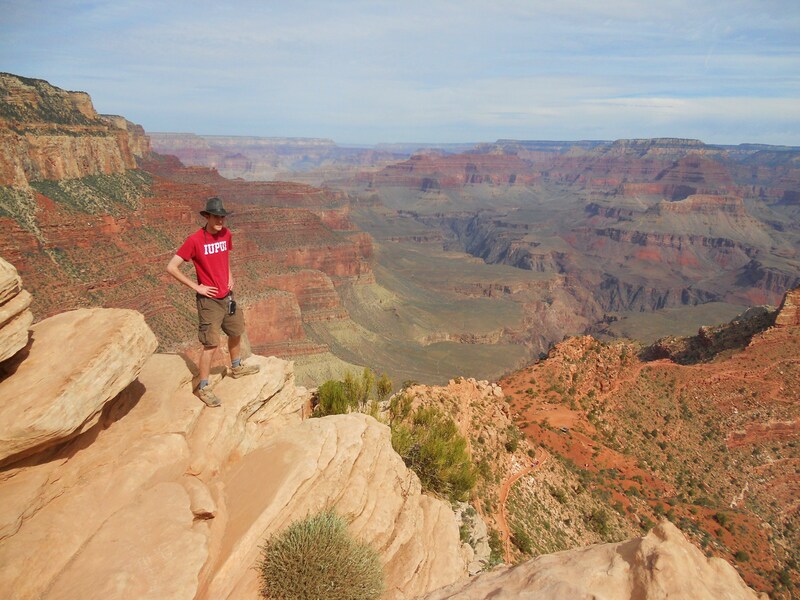 Then, when we made it to the rim, I caught a third wind and felt fine again, and it was Trent’s turn to be miserable. He’d been drinking water instead of Gatorade, and in scientific terms, I think his electrolytes were all sorts of whacked out. Poor dude’s legs were cramping up like something terrible. He could barely even walk. It was only lunchtime, so we were looking at maybe 8 hours of rest before we needed to start the return trip (since the headlamp option was much more appealing than dealing with the heat). Given our physical state, though, we decided to bail. Trent just happened to bump into the last rim-to-rim shuttle of the day, which just happened to have two seats left in the back. Normally I hate bailing, but I think this was one of those cases where “DNF” stands for “did nothing fatal”. If things had deteriorated on the return trip, we’d have been looking at a lot of pain just to get back to the car. Plus, we’d already basically run a marathon, with something like 10,000 feet of elevation change. So I feel like we got our money’s worth out of the trip. We crashed at a cheap hotel in Flagstaff that night, and the next morning we were both hobbling around like cripples. So, naturally, we decided to do some peak bagging. 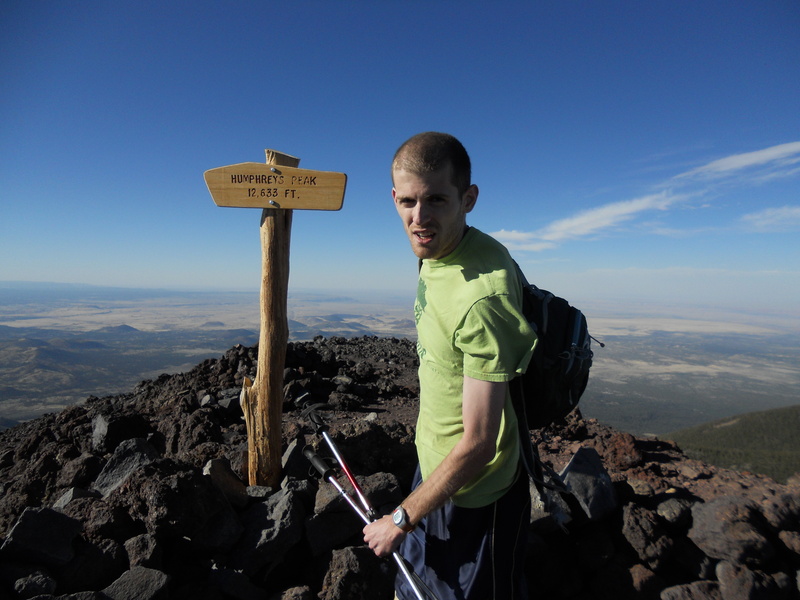 We spent the day clmbing a couple of mountains in the area, including Humphreys Peak (the highest point in the state of Arizona). It was a pretty fun time. Great scenery. Pro-tip for any other runners out there with rim-to-rim-to-rim aspirations: do it in the spring, or do it in the fall, or do it *entirely* at night. Or get burned, like we did. 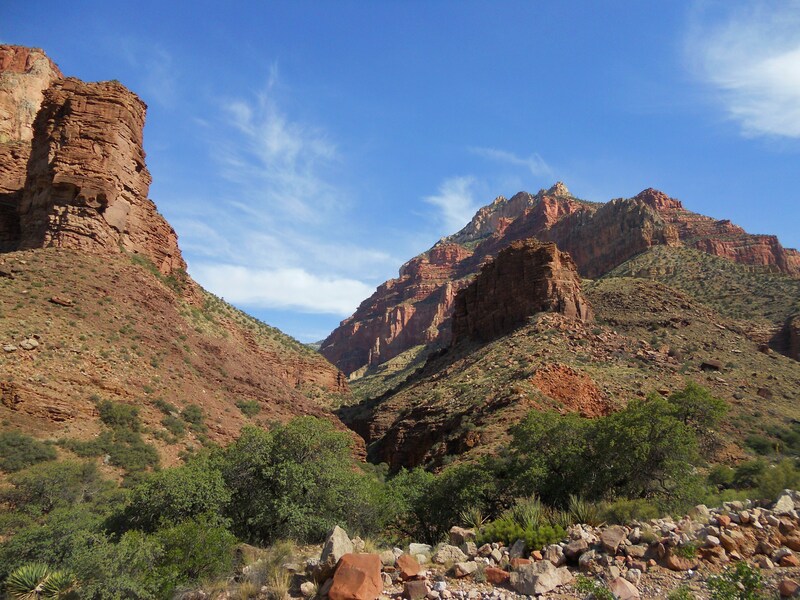 Since we had the rest of the day at our disposal, we walked a short distance up the North Kaibab trail before turning down the Clear Creek trail. 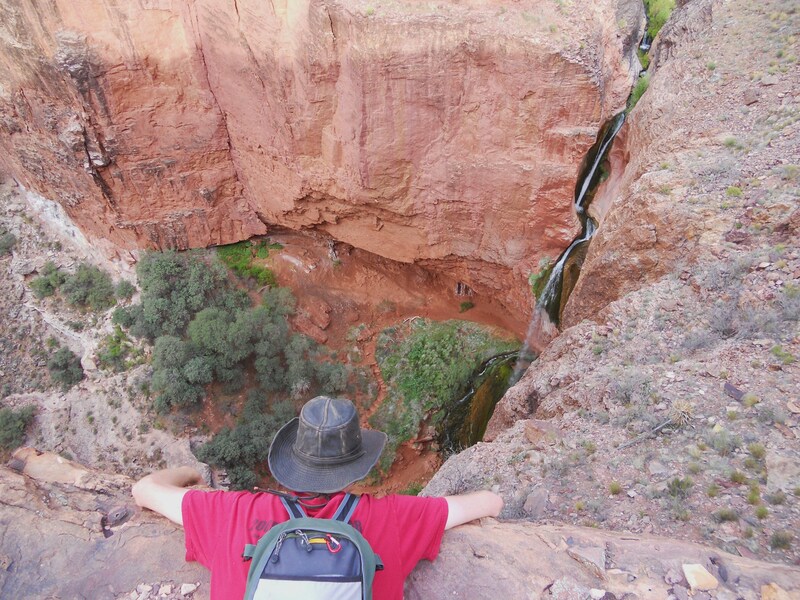 Though we only walked 5 miles or so, we climbed high enough to gain some nice views of the Colorado River and Phantom Ranch. 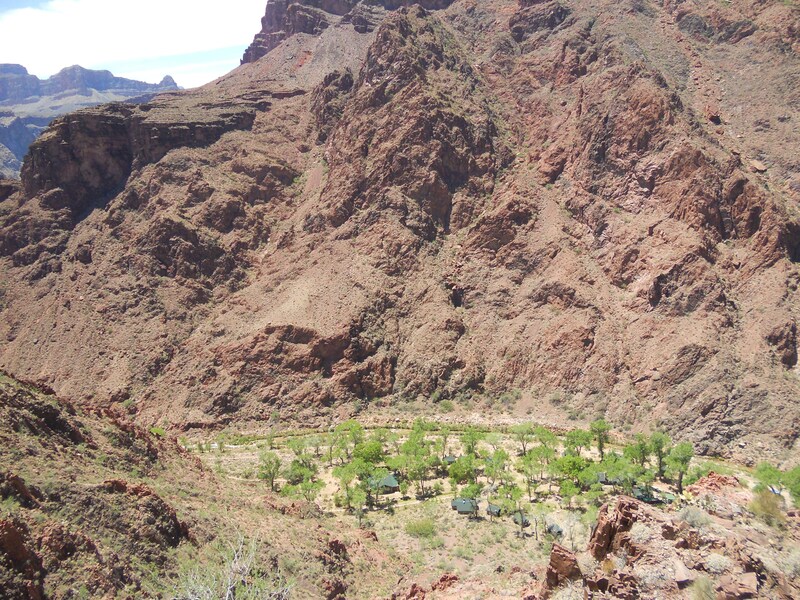 The ranch is a primitive collection of cabins and bunkhouses popular among those who arrive via mule or raft; reservations supposedly fill up a year in advance. We returned to our campsite fairly early in the afternoon, since we both thought it best to rest up for the long climb ahead of us the next day. I took a siesta while Allison worked on her thumb-twiddling skills. After cooling off in the stream and cooking dinner (chicken vindaloo for myself and beef stroganoff for Allison), we retired early. 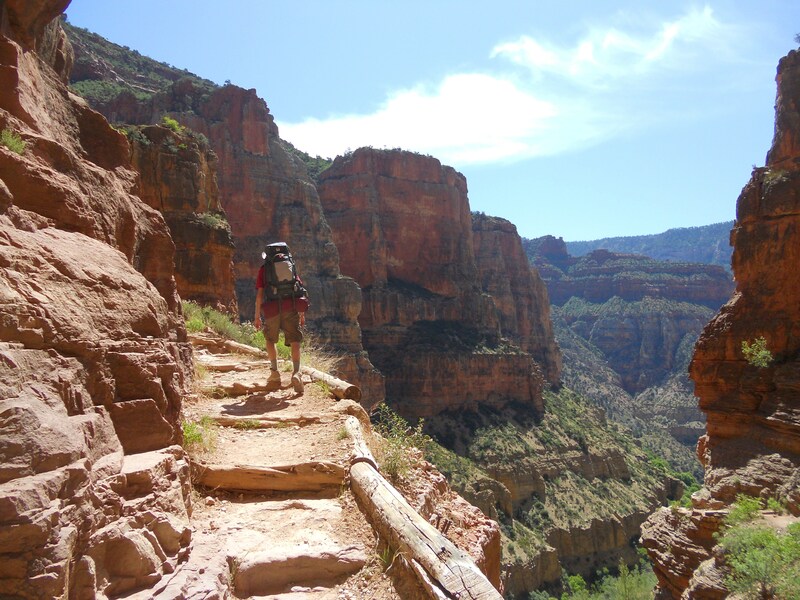 Friday was our designated “death march” day – 14.0 miles on the North Kaibab trail gaining 5761’ in elevation (with our heavy packs) in order to reach the North Rim, followed by another 5.3 miles of hiking on the rim between the trailhead, lodge, and campground. 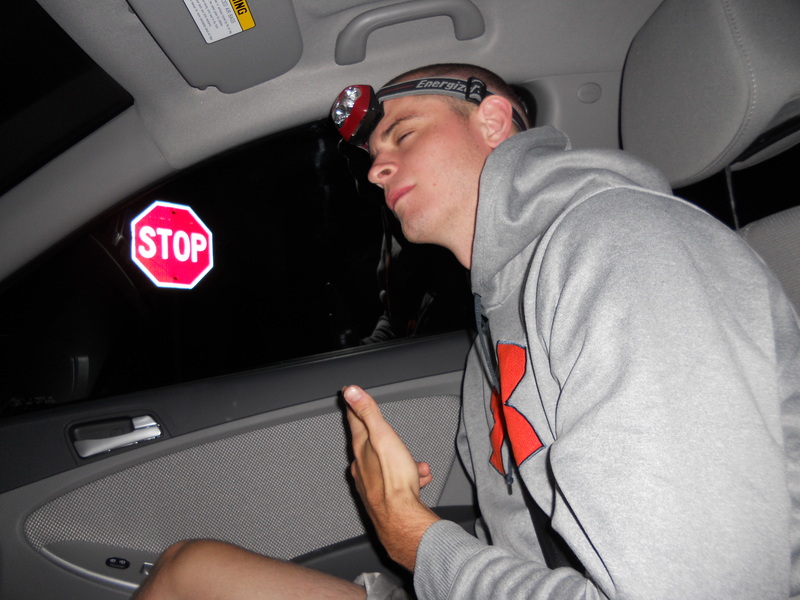 Needless to say, we hit the trail before dawn (4:29am by my watch) in order to stay cool. 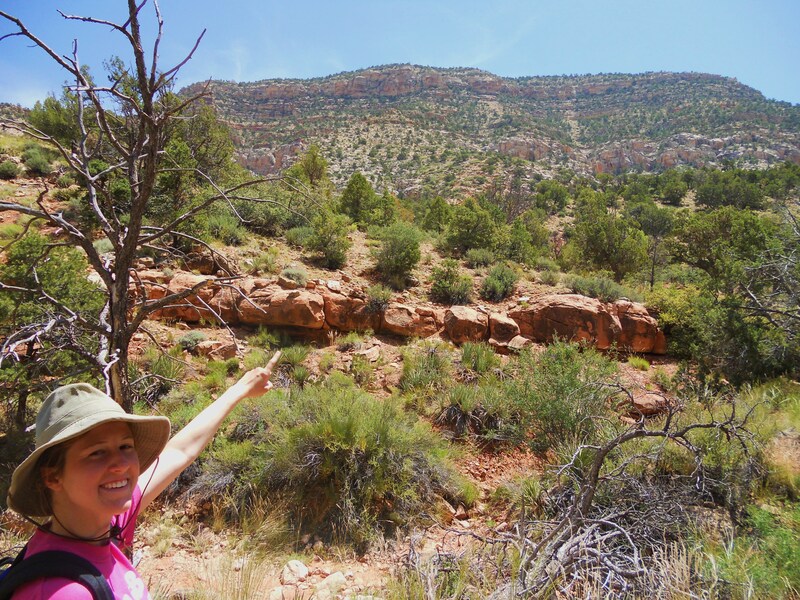 The first 7.2 miles of the hike was a nice and gradual path through a box canyon. We made great time, and even stopped for a short side trip to see Ribbon Falls (0.6 miles). 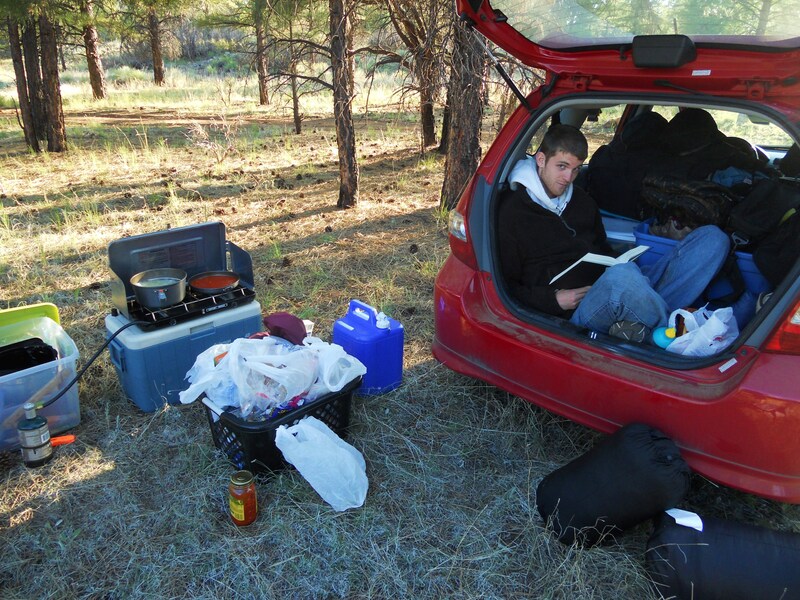 We took a short break for “lunch” in Cottonwood campground around 8:00am before tackling the 6.8 miles of brutal switchbacks separating us from the North Rim. 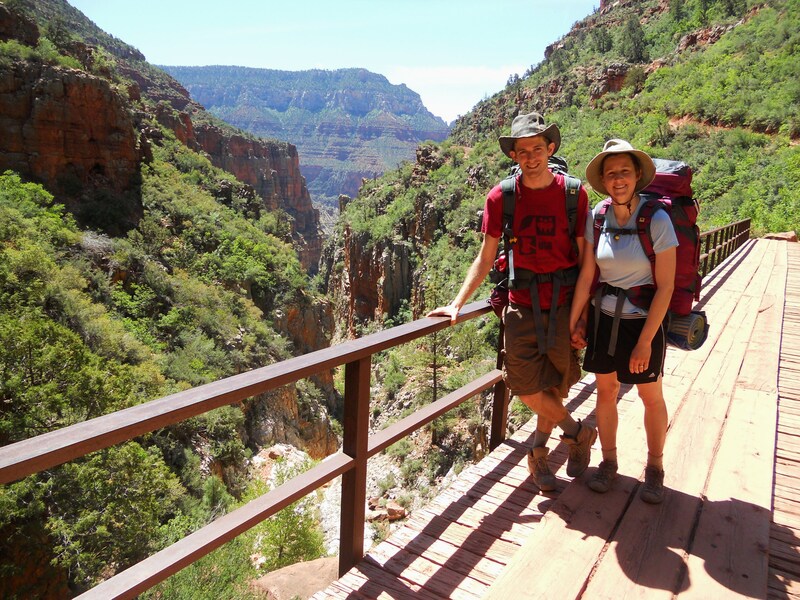 Although considerably less popular than trails on the South Rim, Allison and I both thought the North Kaibab trail was the most scenic of any we’d hiked. 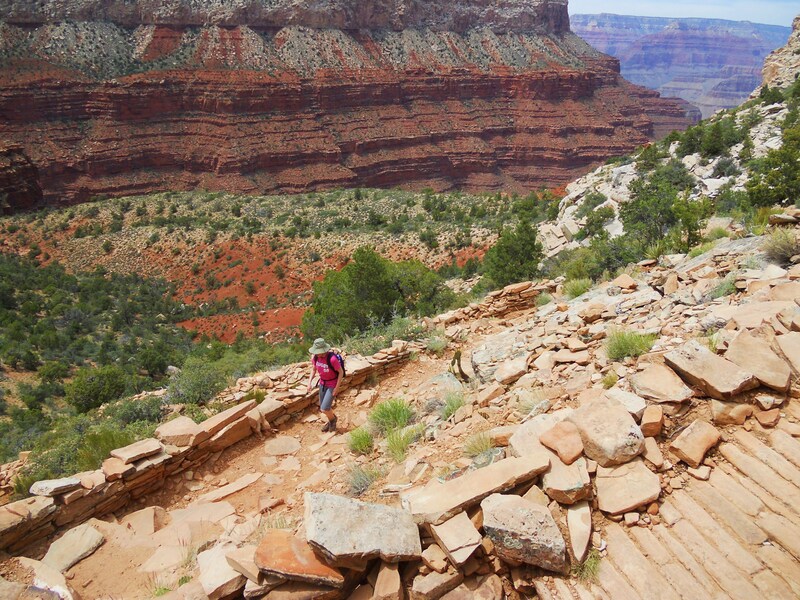 The final 1.7 mile stretch from Supai Tunnel to the trailhead was steep, agonizing, and covered in mule poo. 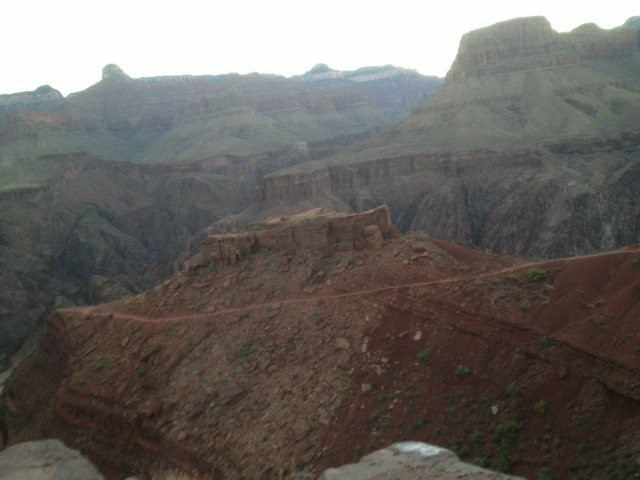 We’d passed several helicopter pads on the way up, however, and knew there were actually two ways out of the canyon. Unfortunately, one of them bills for five grand. So we pressed on. We finally made it to the top around 12:30pm, where we were rewarded with the best campsite in the park (reserved exclusively for backpackers and cyclists). 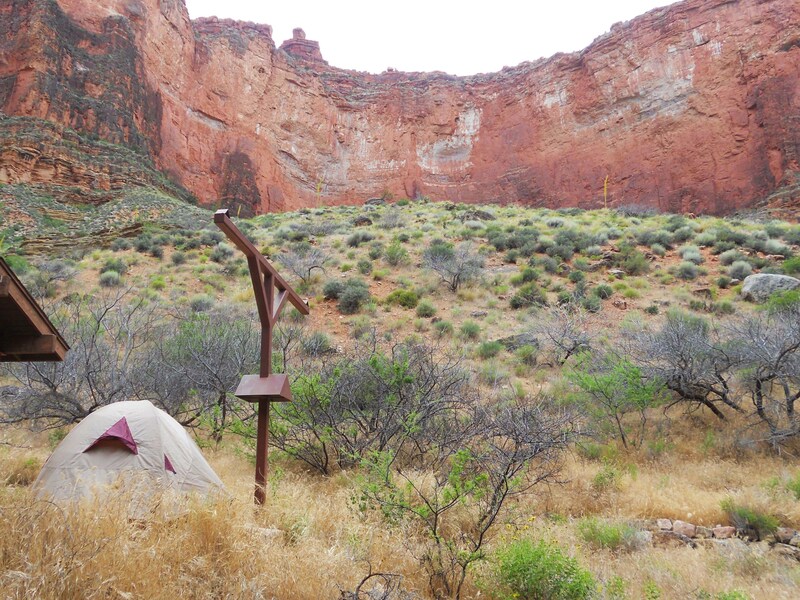 Our tent was perched mere feet from the rim of the canyon. 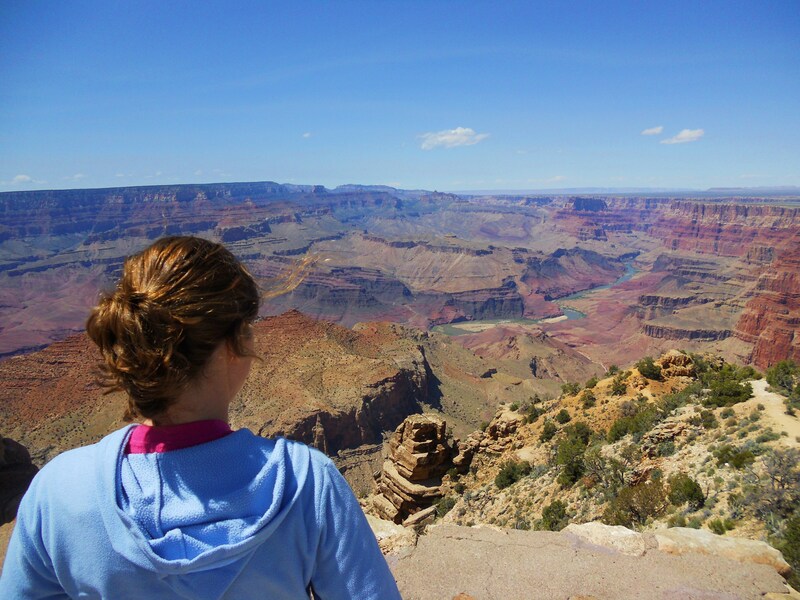 The trip finally ended on Saturday morning when we forked over $160 for the five-hour shuttle ride back to the South Rim (only 10 miles as the bird flies, but 200+ by car). 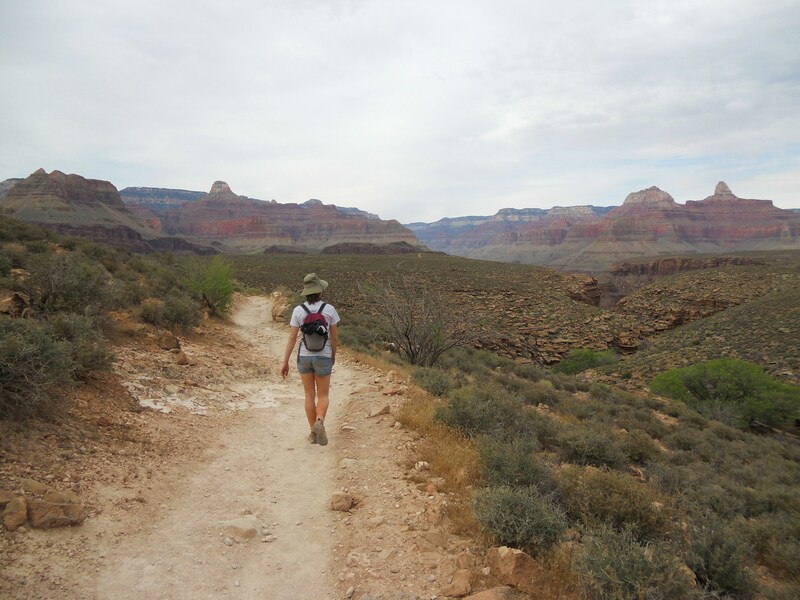 The first leg of our backpacking trip was fairly easy – a 0.4 mile walk to the Bright Angel trailhead and 4.8 mile descent to Indian Gardens. 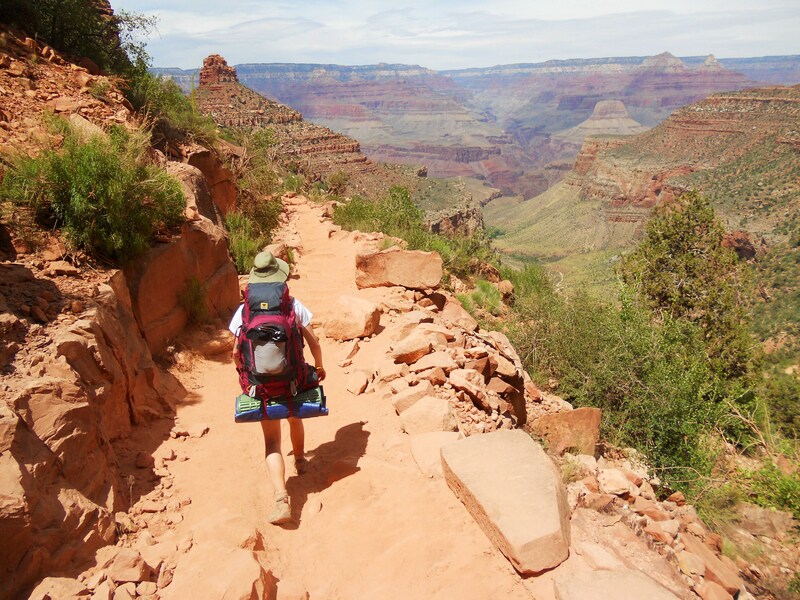 This is probably the most popular section of trail in the entire park, so we had to do a bit of maneuvering to get past certain overweight tourists with our cumbersome packs. 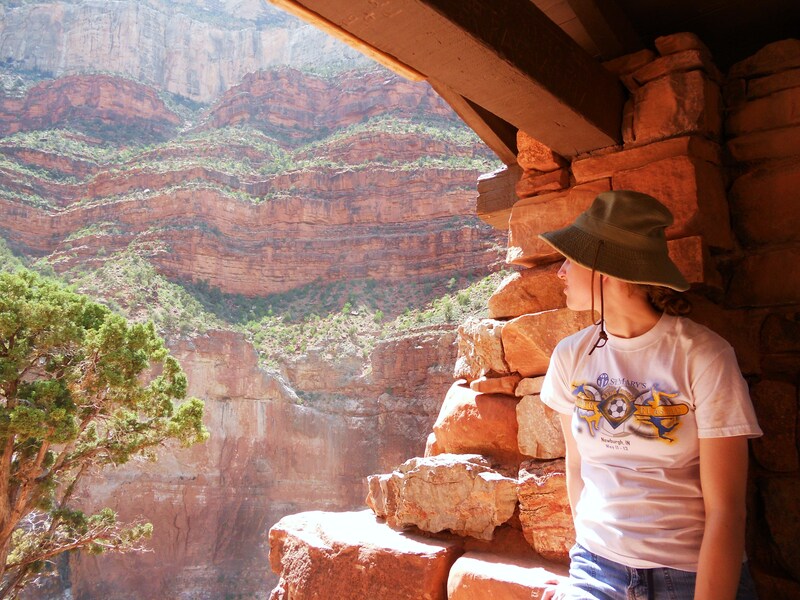 This is something we’ve noticed at all the national parks we’ve visited. 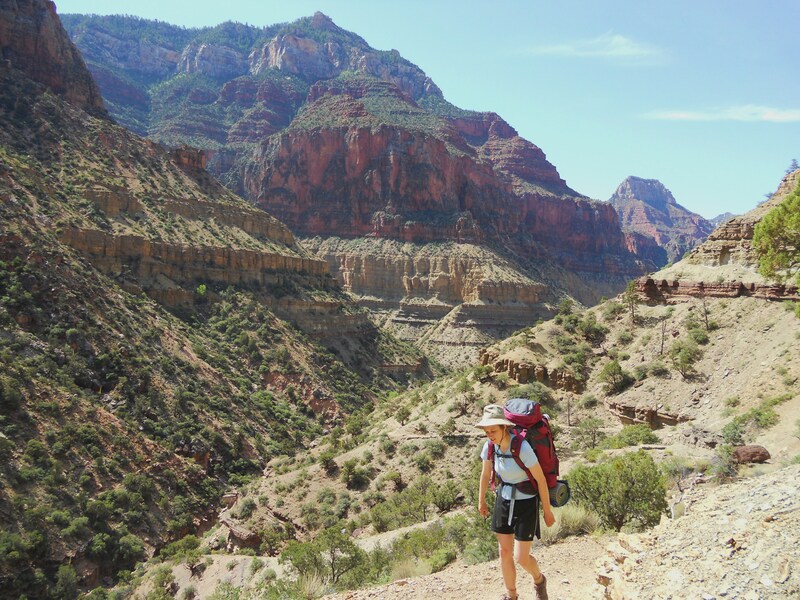 The short and easy trails are always packed with out-of-shape Americans (95%+), while the more strenuous backcountry trails are heavily populated with athletic Europeans (50%+). We honestly hear as much French and German on the longer hikes as we do English. After a couple short rest stops, we arrived at the Indian Gardens campground around 4:00pm. 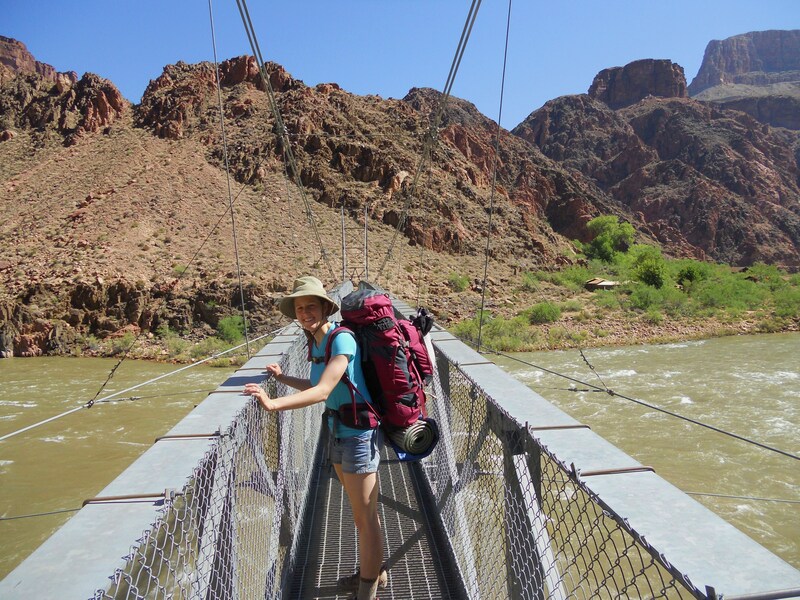 We took a few minutes to select a campsite (complete with picnic table and ammo boxes for food storage) and set up the tent, then walked another 1.5 miles to Plateau Point. 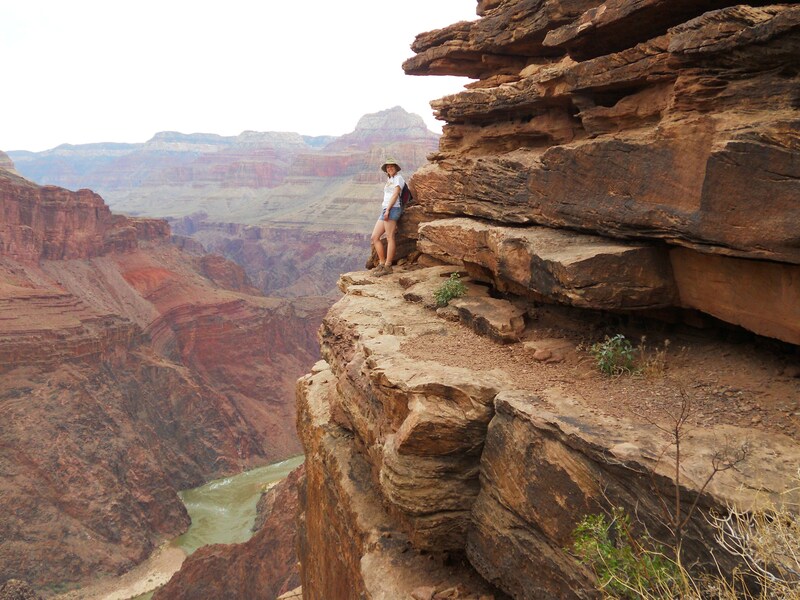 Plateau Point serves as a nice “mid-way” viewpoint in the canyon, ~1500’ above the Colorado River and ~3000’ below the South Rim. 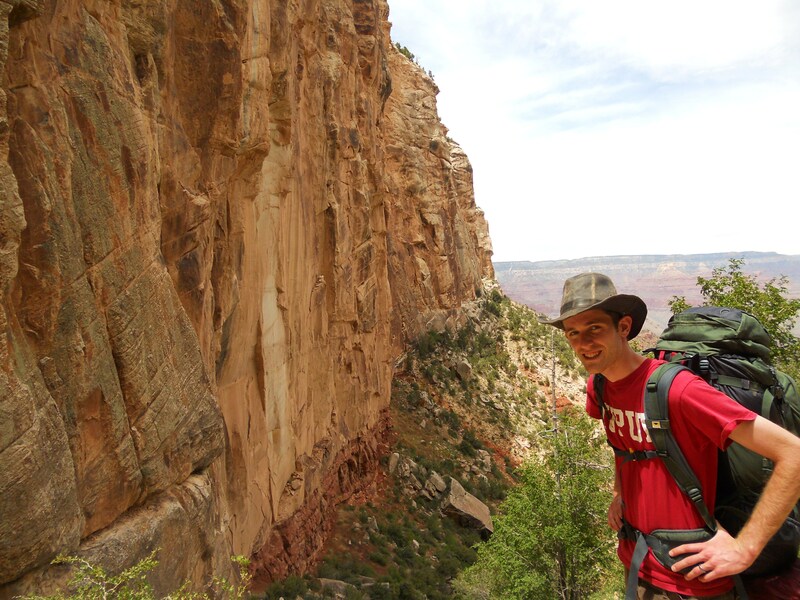 We spent a little time taking pictures and scrambling on rock formations, then started walking back to camp. On the way, I noticed a rattling noise a few feet from where Allison was walking. 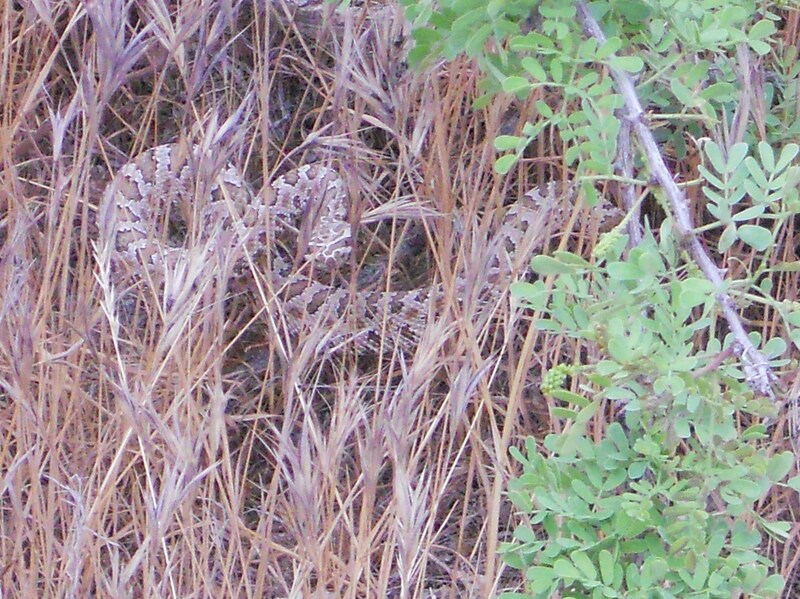 After some cautious poking around, I successfully located a small rattlesnake hiding in the tall grass. We hastily retreated back to camp. I killed it with a rock and cooked it for dinner. 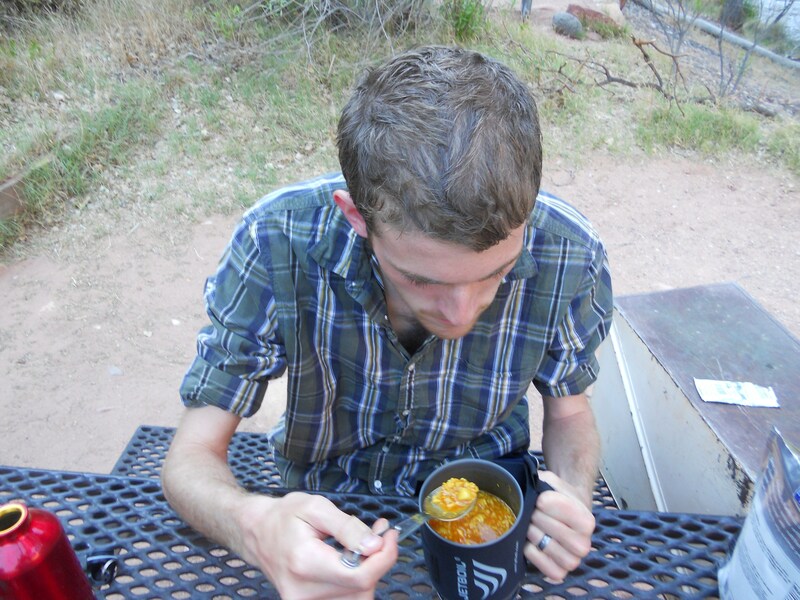 Our new backpacking stove really did pay for itself that first night – hot Ramen noodles taste even better after a long day of hiking. Since our campground for the following night was only 4.7 miles away, we decided to sleep in. By “sleep in,” I mean that we rolled out of bed at 6:30am and were the very last people to vacate the camp. 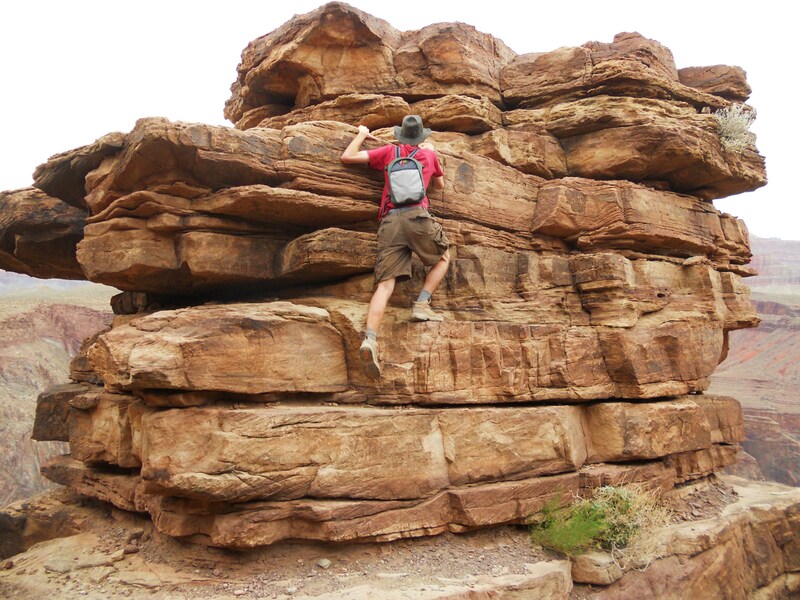 For obvious reasons, most hikers prefer to start early in the desert. 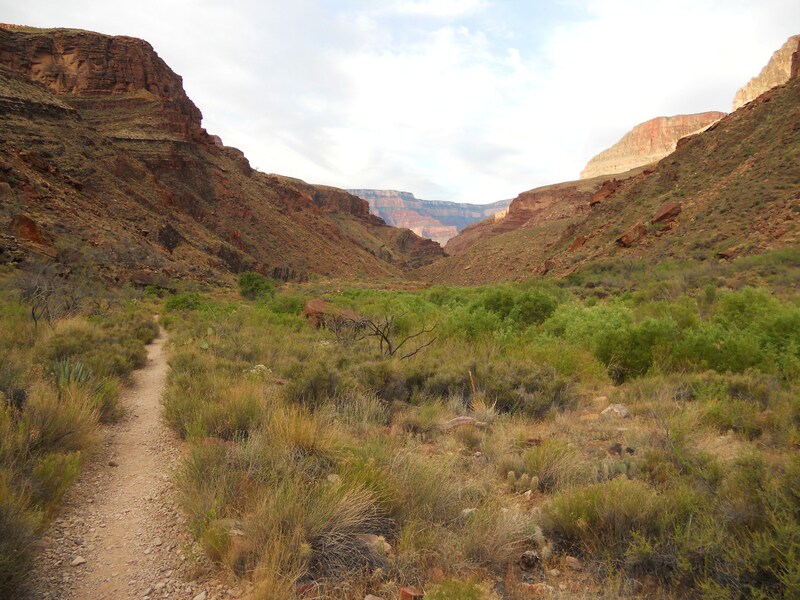 The section of trail between Indian Gardens and the Bright Angel campground is sometimes referred to as “Devil’s Corkscrew” – several miles of jagged switchbacks leading down to the Colorado River. We played tortoise and the hare with an out-of-shape jogger for most of the way (yep, the tortoise won), and crossed the river around 9:30am. 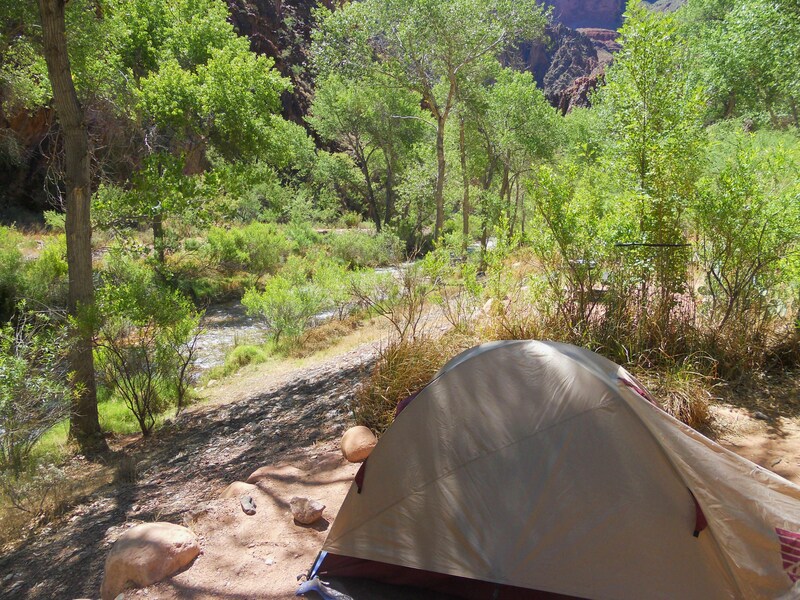 One of the advantages to arriving early was that we were able to occupy a choice campsite along the creek. After wolfing down some peanut butter sandwiches and tuna, we dropped our packs and left for a short day hike. After suffering from rain/snow/hail for 13 of the first 15 days of the trip, the weather has finally cleared. Mostly sunny; highs in the 80’s and 90’s; lows in the 30’s and 40’s. 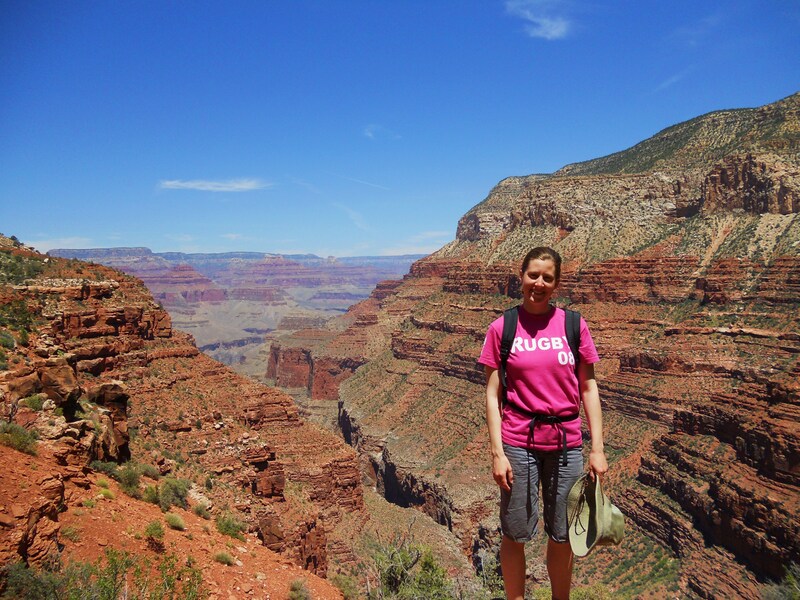 We arrived in Grand Canyon National Park on Sunday afternoon and spent a few hours visiting some of the “touristy” attractions and walking along the Rim Trail (roughly 2.5 miles). 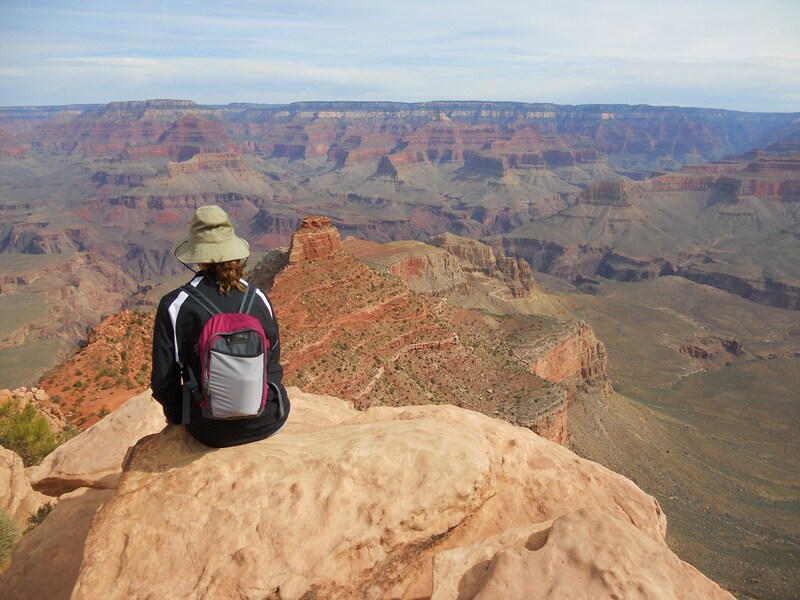 We also talked with a ranger in the backcountry office and received a waitlist number for a trip into the canyon. 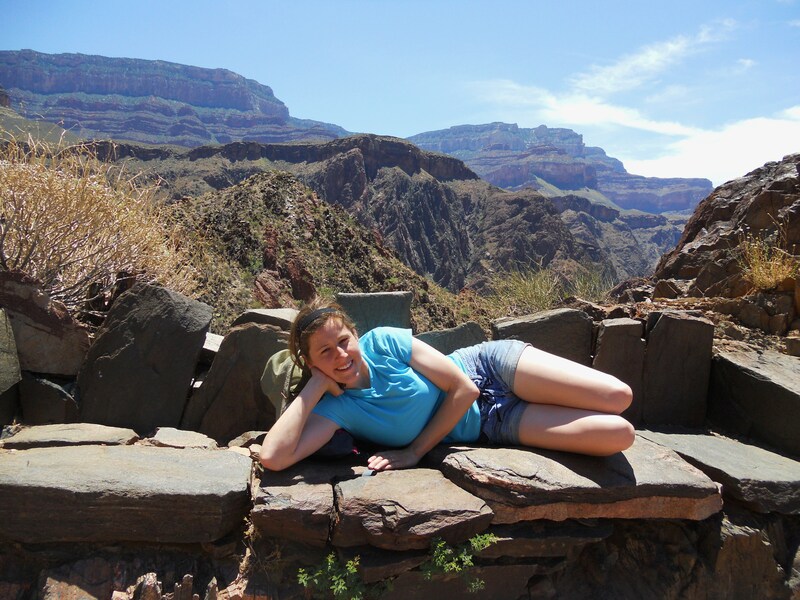 The spaces are extremely limited for walk-ins like us, since most backpackers book spots 4 months in advance. 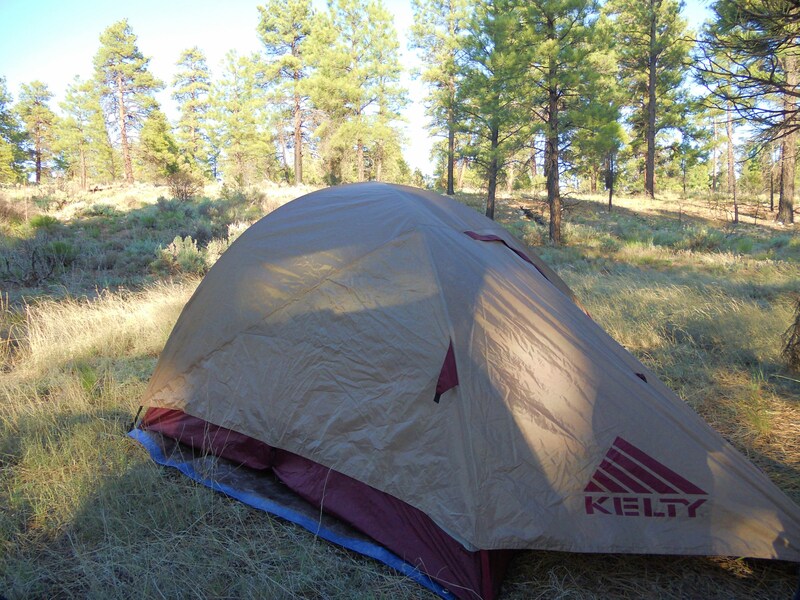 We camped in the Kaibab National Forest on Sunday night – pulling the car off a dirt road and setting up in a grove of pine trees. Allison made spaghetti on the camp stove, and I talked her into playing a few games of “poor man’s bocce ball” using pine cones and some rocks. After securing our permit, we took a shuttle to the Hermit’s Rest trailhead. Not wanting to burn ourselves out, we only hiked about 9.0 total miles for the day. 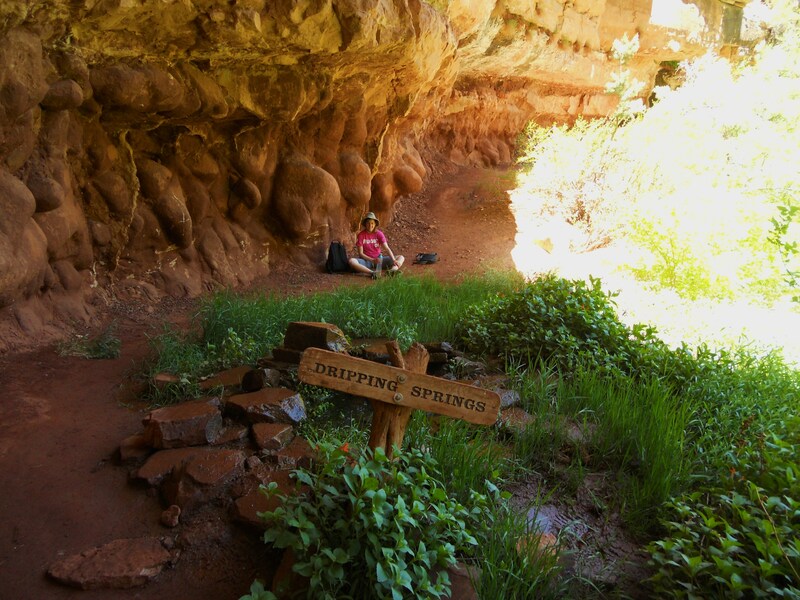 Following the trail into the canyon, we took some branch-offs to see the Santa Maria Spring and the Dripping Spring (not super exciting to be honest, unless you’re really into watching water drip out the side of a cliff). 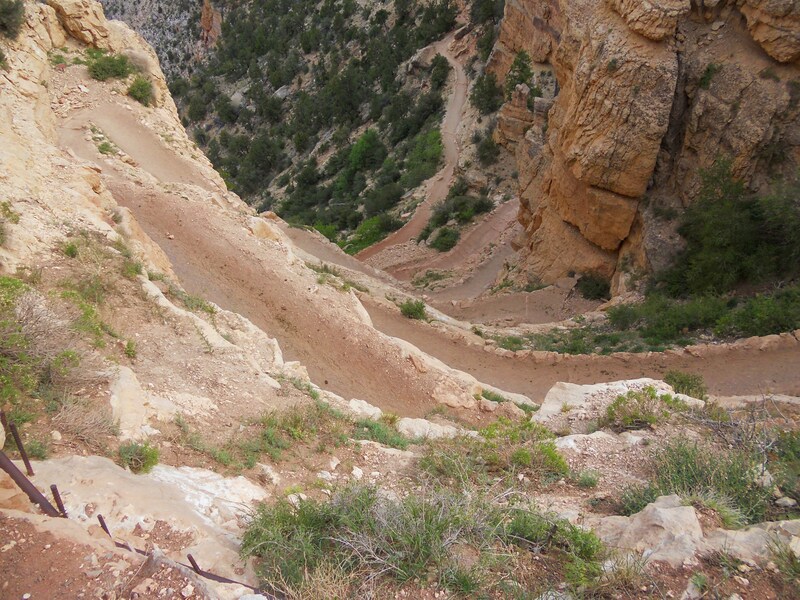 The trail featured countless switchbacks and required a small amount of scrambling, but it offered some great views. 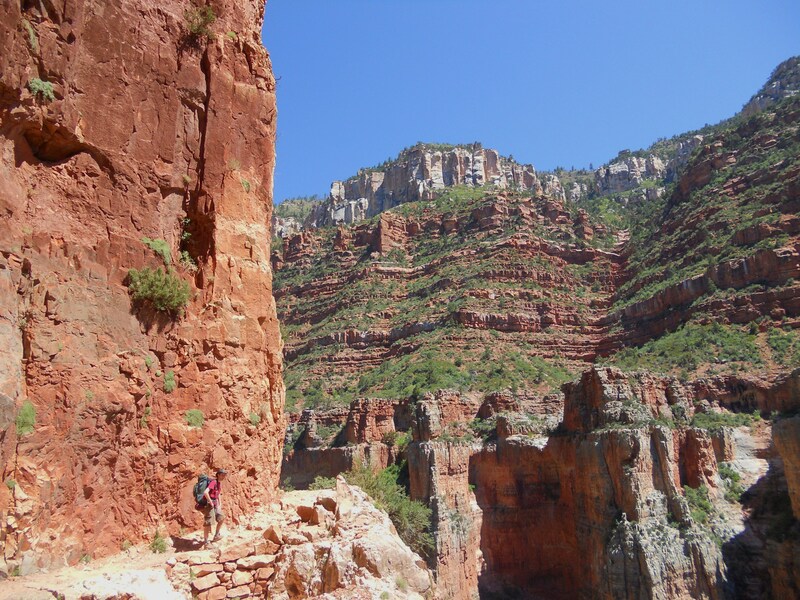 Rather than descending into the “main canyon,” the Hermit Trail actually winds through a scenic side canyon. 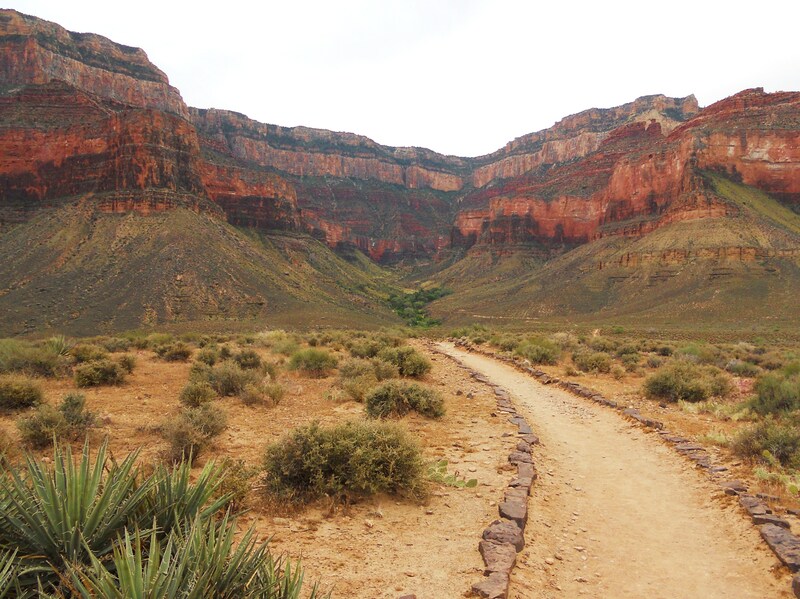 It’s far less traveled (from what I understand) than the more popular trails, but it also lacks the sheer drop-offs and panoramic views we’ll be seeing later in the week. It’s very tame, so I’d definitely recommend it for anyone afraid of heights. On Wednesday morning, we decided there would be plenty of time for a morning hike before starting on the backpacking trip. 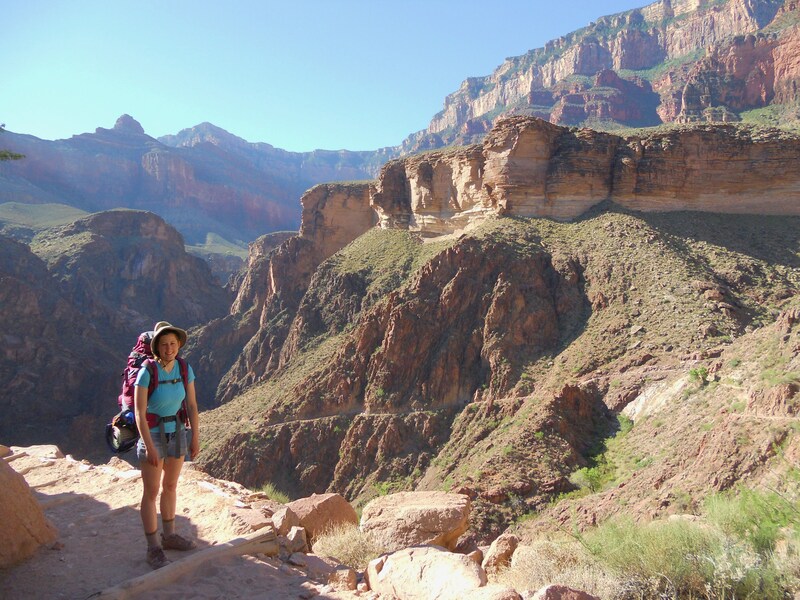 After parking along the rim, we descended the South Kaibab trail to Skeleton Point and back (7.6 miles, including connection trail along the rim). 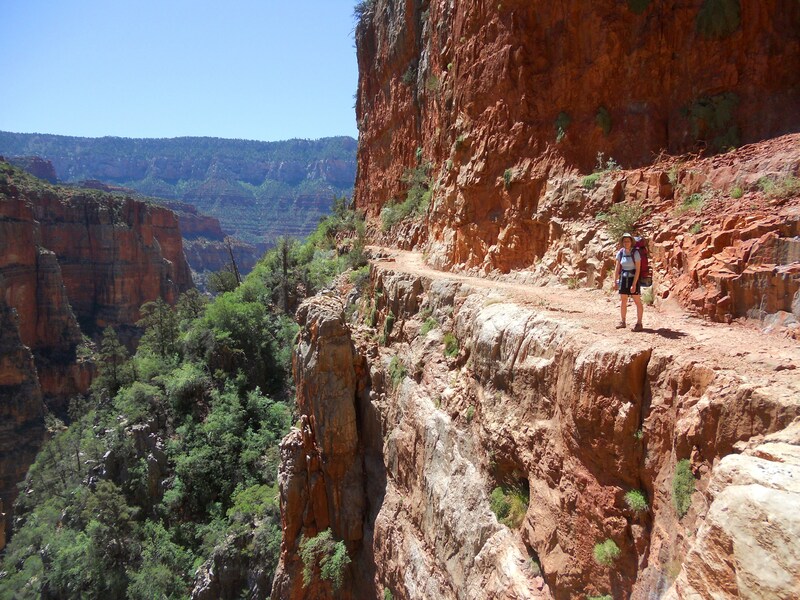 The South Kaibab trail is actually the shortest route to the Colorado River (7-8 miles each way, I believe), so we encountered several people attempting to make it down and back in one day. 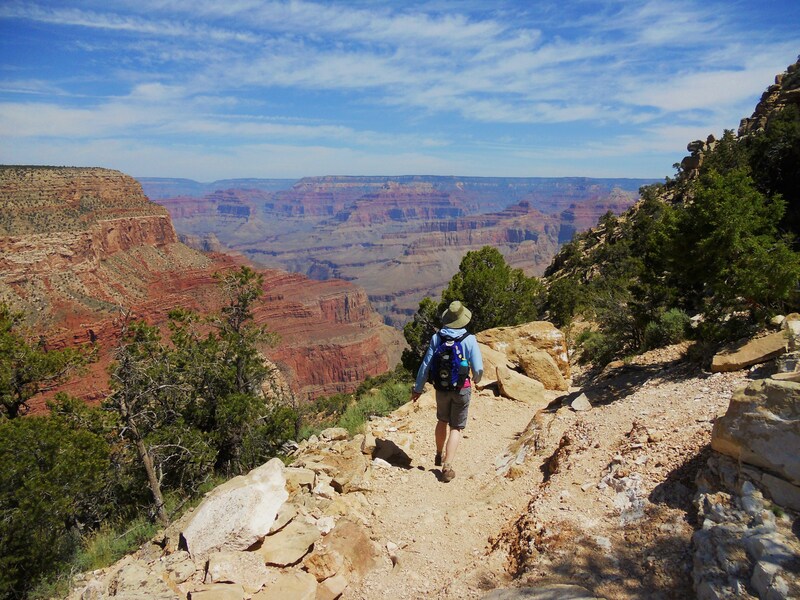 The trail follows a ridgeline into the main canyon, offering sweeping views from a number of vistas (including the aptly named “Ooh Ahh Point”). View from "Ooh Ahh Point"
We made it back to the car sometime around noon, grabbed some lunch at a cafeteria, and set off for our backpacking trip around 2:00pm.